What is the "Computer Blackbox" function? Black boxes are usually used in airplanes and other vehicles to record activity before a crash. 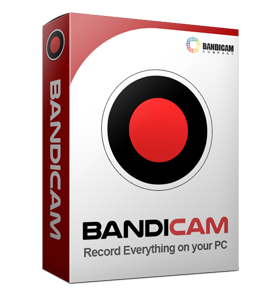 The purpose of the Computer Blackbox function of Bandicam is to record your desktop screen and sound for 24 hours & 365 days. It can be good PC Monitoring/Surveillance Software. Most users: Record your full computer screen continuously from when Windows starts. QA jobs: Easily find mistakes or defects of your products by recording your computer screen. PC Monitoring, Surveillance: Check/Monitor if bank tellers, telemarketers, clerks, shop assistants, part-time workers are following the company's policy. Trading system: Record your trading system of stocks, bonds, futures, options, Forex which prices fluctuate almost every second. Server/Network monitoring: Record the traffic screen of web servers, network servers, storage servers. CCTV/Camera: Record the screen of closed-circuit television (CCTV) cameras for over 24 hours if it can be seen on your PC. 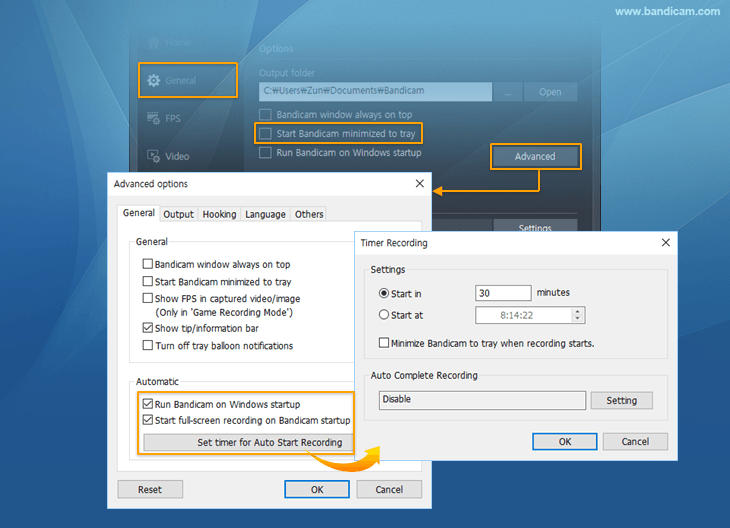 Please check "Start Bandicam minimized to tray (Optional)", "Run Bandicam on Windows startup" and "Start full-screen recording on Bandicam startup" to record your computer screen when Windows starts. If you want to automatically start recording at a specific time, check the "Set timer for Auto Start Recording" option. 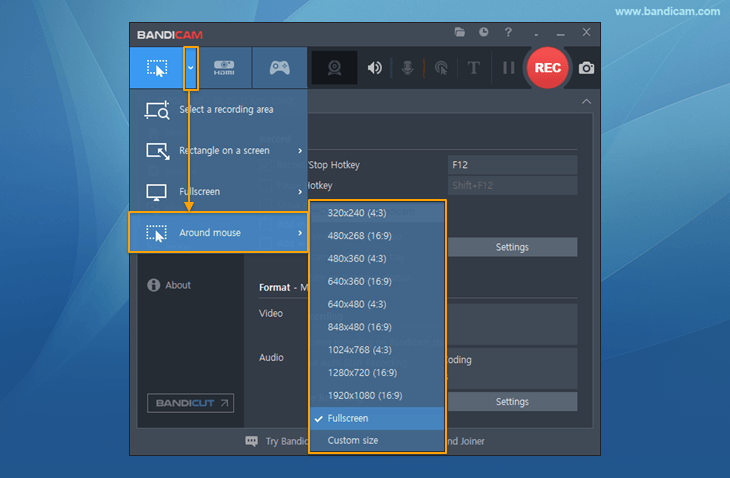 If you want to start recording at a specific time on a daily/weekly schedule, please refer to "Bandicam Scheduled Recording" or "Task Scheduler Recording". If you have to record your computer for a long time, we highly recommend you use the "Auto Complete Recording" function to store the videos safely. If you want to create the video file every hour, choose "1 hour" at the recording time menu, and choose the "Start new recording" option as shown above. Please also select the "Never" option at the "Power & sleep settings" when you record a computer for a long time. We recommend you choose the "AVI" container; it will allow you to repair a corrupted/broken file through Bandifix. 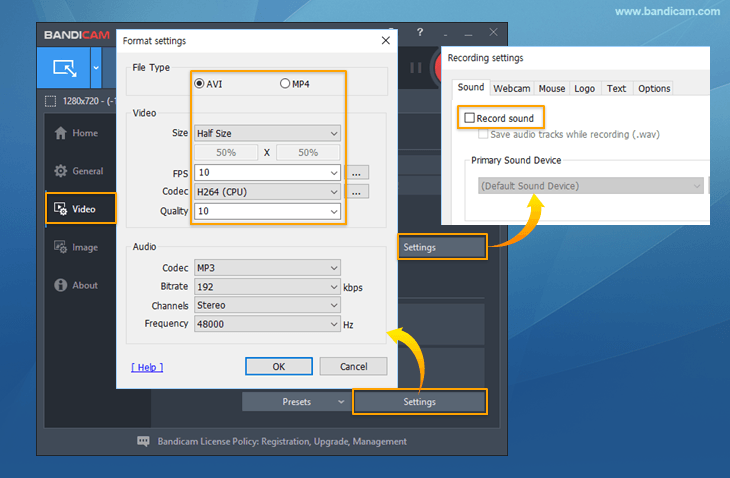 If you use the "Around mouse" recording mode and "Windows Task Scheduler", you can automatically record your computer screen when Windows starts without the recorder status bar. Select the "Fullscreen" option under the 'Around mouse' mode and close Bandicam. Click on Start, type in "Task" and click "Task Scheduler", and select the "At log on" option to record your computer screen when Windows starts. 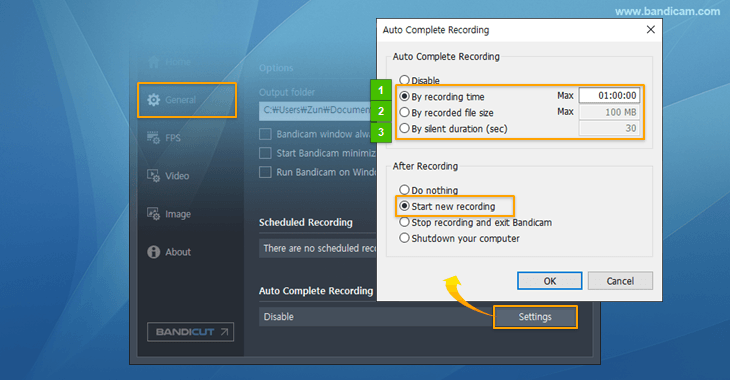 For more information, please refer to "How to start recording automatically with Windows Task Scheduler". If you have recorded your desktop screen for a long time, you may want to remove the unwanted part of the video. Please try Bandicut (https://www.bandicam.com/bandicut-video-cutter/) to save only the part of the video that you want without losing the original video quality.